We are located in the Central Time zone. Address: Please call or email if you would like our mailing address. We are located in Des Moines Iowa. Wallypop is my home business, based in Des Moines, Iowa. I am Sarah Reid, Work At Home Mom (WAHM) and mommy of three. I've always enjoyed sewing - I began when I was a very little girl. We chose to use cloth diapers on our oldest (Wally) because we knew it was the best thing for him. (The financial aspect helped, too!) 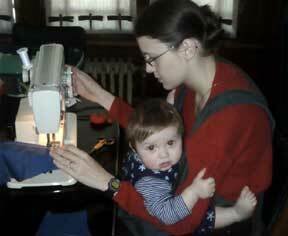 When I was pregnant with Wally, I began to sew diapers for him. That's when I discovered how fun it is to sew diapers! 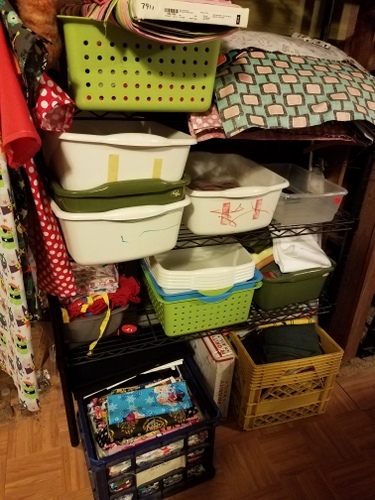 I started sewing a few diapers for friends online, who told their friends, etc., and by the time Wally was born, I realized that this could be a viable home business. I needed a source of income and wanted to do something I enjoy, so Wallypop was born shortly after Wally was! 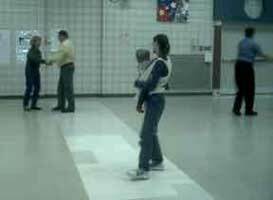 Wearing Wally in a wrap during one of our evening dance classes. This baby is now 14. Wallypop is a Green company! We strive to do everything we can to reduce waste and reduce our environmental impact. 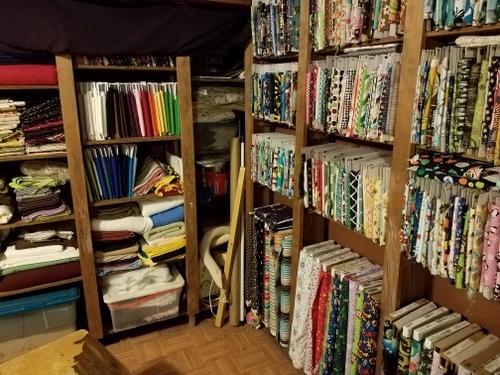 I cut my products to use as much of the fabric as possible, and I reuse the scraps. The fabric scraps I can't use, I pass along to a friend I know who makes crazy quilts which are mailed to missionary friends of hers to be distributed to the people in the country in which they live. We try to reduce our paper use, and almost every piece of paper I use, gets used on both sides. (Either I use the back as scratch paper, or the kids use it, or we use it for homeschooling.) I don't include printed receipts in packages for this reason. We don't use packaging of any sort, most packaging is just thrown away anyway! In-person customers who don't bring their own bags take their items home in re-used grocery bags, and mail-order customers get their orders in re-used boxes when possible. We keep our energy usage under control and buy products made by other WAHMs in America or made under good working conditions when possible. I do all of the shopping and most of the labor myself. I buy fabric and supplies from a variety of sources - online retail, wholesale, and locally. I tend to prefer to work assembly-line style, so I typically make items for inventory in chunks of 10-40 at a time. I currently have a high schooler, a tween, and a younger child with special needs. I do most of my work in the afternoons after the schoolwork that needs my involvement has wrapped up. I've got toys, movies, and a giant hammock in my office to entertain the youngest and keep him out of trouble, and I often need to stop working to take care of his needs - feeding pump alarms, med alarms, whatever. I don't have any babies small enough to snuggle in the Mei Tai while I work any more! Please take a look around. I enjoy being able to provide my customers with high-quality, WAHM-made items. 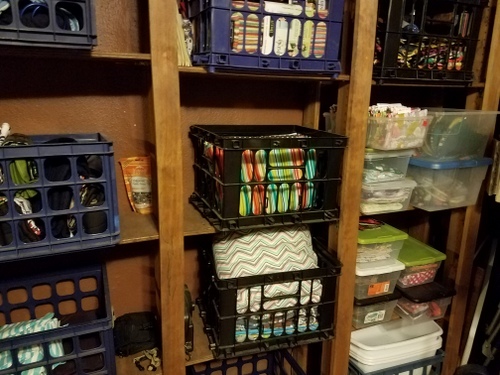 This is my fabric shelving, and my inventory shelving. 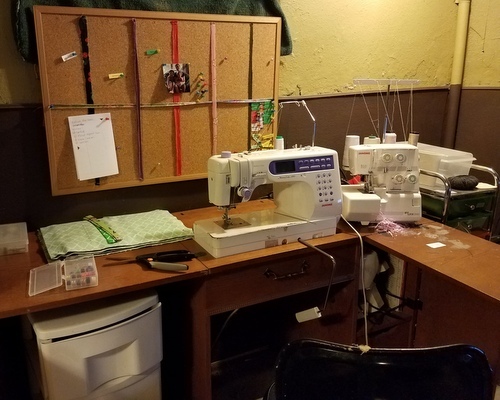 My current projects area and my sewing area.